United striker makes history for national side. Manchester United striker Robin van Persie made history for the Dutch national team on Friday evening as he made it three World Cups on the scoresheet for the Netherlands, according to Marca. The 30-year-old scored twice against reigning champions Spain in a shock 5-1 victory in their opening group game, and his equaliser in the 44th minute was the strike that made history, as he became the first Dutch player to score at three consecutive World Cup tournaments. His team-mate Arjen Robben later matched that feat by scoring twice himself, in what will no doubt go down as one of the most memorable and biggest upsets in the history of this great competition. 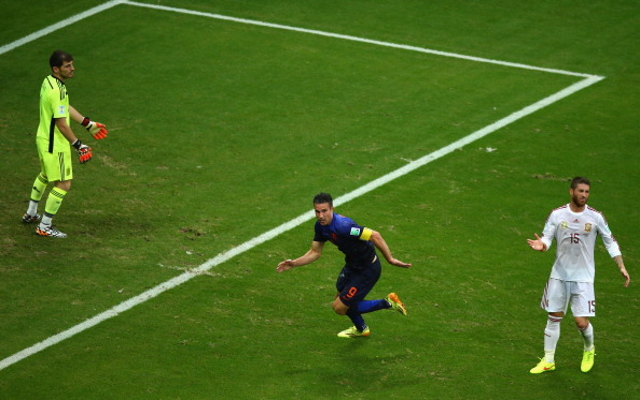 After a highly disappointing season at club level for van Persie, a good tournament for Holland would certainly be good for him and for new United manager Louis van Gaal, who will lead the national side until leaving to take up the post at Old Trafford full time at the end of the finals in Brazil. Van Persie now has 45 goals in 85 appearances for his country, and can further cement his status as one of the best strikers in the world with more impressive displays at a major international tournament, after already proving himself as a star of the Premier League.